It was over a year ago that I had noted that a bank near me, or at least someone who worked at the bank, seemed to place a card in the window each morning. I didn't know why. Yesterday, I found out why. Kind of. After many months of walking past the bank and feeling reassured that there would be another card in the window, I decided to finally give into my curiosity and enter the bank. I'm normally walking past at a time before the bank has opened, but yesterday I was walking past just as it turned 9:30. Opening time. There was no queue. Straight up to the bank desk. "Morning...", I fumble as the bank clerk makes eye contact, "...bit of an odd one this. 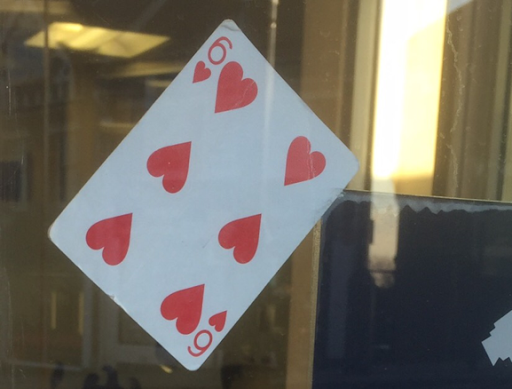 I've been walking past the bank each morning and I notice that a different playing card appears in the window every day. I was just wondering, well, why...?". Silence. The bank clerk stares back at me. "Er..." her eyes soften as she thinks what to say. Maybe she doesn't know. Maybe she neither knows nor cares. She sheepishly looks to her left to her colleague who is emptying bags of cash into the drawer in front of her (or whatever bank clerks do first thing of a morning). This one also stares back at me. But she's more decisive. "It's part of our security processes. That's all we can say." And she flashes a quick smile before the steely look returns. And with that, I feel suitably ushered out. So mystery solved. Kind of. It's part of our security processes. But what does that mean? Does each card have a different meaning? Who puts it up? Whatever it means, it feels a bit low-tech doesn't it? My guess is that it is a way of signalling to someone with a security role that the bank opened normally this morning. If, say, the manager was kidnapped or otherwise forced to open the branch against his will, he would presumably omit the step of changing the card, thus signalling to those in the know that there was a problem. Sounds reasonable. An added bit of info is that I think the card is taken down at opening time. Possibly just before. Fart in a Bucket Tuesday!